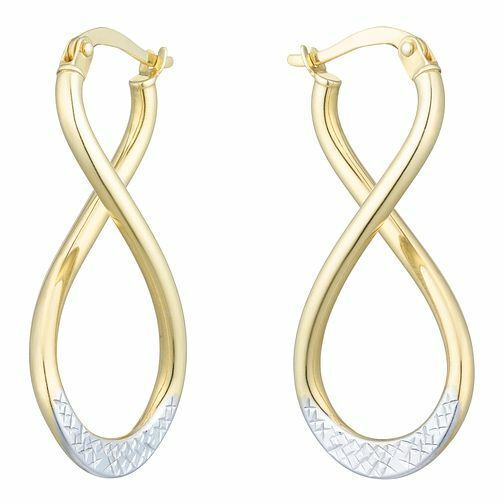 Distinctive design and luxurious materials combine in these figure of eight creole earrings. Created using quality sterling silver and bonded 9 carat yellow gold, these stunning earrings with their unique diamond-cut textured design will add charm and glamour to any look. Together Silver & 9ct Bonded Gold Figure of Eight Earrings is rated 4.0 out of 5 by 1. Rated 4 out of 5 by Anonymous from Creole figure of 8 A beautiful earring. Light and sturdy but a little bit smaller than I expected. The fact that they are not heavy is a plus as it means no dragging or gradual tearing of the piercing. I would recommend these charming but glamourous earrings 100%.